Ubisoft has announced that Watch Dogs is going to be free for PC gamers. The free offer kicks off later today and will run until Monday 13th November. There is just one proviso; you need to have a UPlay account and sign in to claim the game and download it. To be clear, once you claim this game via uPlay it is yours to keep, this isn’t a free period or a time limited demo, only the window of opportunity to claim it is limited. Ahead of its release in 2014, Ubisoft heavily promoted this third person open world hacker stealth-action adventure game. However the game development was hit by delays and when eventually released it got a mixed reception, largely due to graphics discrepancies (marketing vs in-game experience). Additionally, after so much hype some felt the game fell a little flat. Nevertheless, Watch Dogs was used in bundles for Nvidia GeForce GTX graphics cards and went on to be popular. Within five months Ubisoft had sold over nine million copies of the game and a year after the release of the original game a senior Ubisoft developer confirmed Watch Dogs 2 was in development. Watch Dogs 2 was released a year ago and moved the series to San Francisco. It featured a new protagonist and refinements to the Watch Dogs style of gameplay all around – but especially with regard to controlling and using vehicles. If you are interested in grabbing the original Watch Dogs for free, head on over to the promotion page. 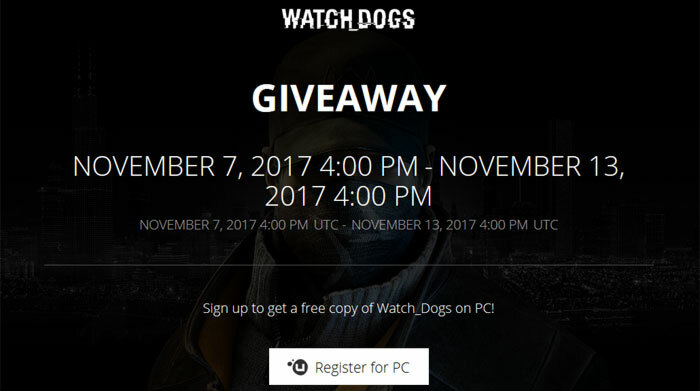 It says the giveaway starts at 4pm UTC today (UTC seems to be the same as GMT) and runs until 4pm on Monday, 13th November. Click through to register and claim the game and if you are eager you can even start to pre-load the game before this freebie is unlocked. Of course UTC is GMT; until GMT is BST….comes with it being the default time zone. All are measured =/- to it. preloading now - I always fancied a shot at this but never had time. This was a similar kind of story to other ubi games when it fist came out RE optimization on PC, but I bought the ps4 version and the digital trips and side activities were really good to the point I missed them in the WD2 and longed for their return. Now that enough time has passed for bad optimization to no longer be an issue (they did patch it up quite well I believe in the end, and we/I have far more beefy hardware now too) I may re-visit this, can't complain for free! I remember the trailer footage looking stunning… and then finding that the released game had stunning environments, but with stuttery character animations. Gameplay was OK, kept me occupied for a bit. Did some missions and stuff, ended up doing one taht took a little longer than usual, only to find it suddenly got a bit harder and only then realised I was playing the final mission of the main campaign… and then it was over. I had a few little things I could drive around and do, but the game was then done. Can't complain for free, but it wasn't anywhere near as good as I was expecting. Didn't even bother looking into WD2. Bah - I've got 2 factor authentication turned on, but haven't used the account in years so no chance google authenticator will work and no backup system other than contact us. Would a text based backup be so hard ubisoft… Then again this is ubisoft… I don't want to start a new account either as I have some old games on it. Is watchdogs worth the effort of contacting ubisoft is the question?